Non Toxic, Microwaveable, and Re-usable for dozens of unique molds. ComposiMold is a 100% reusable mold making material that works by melting and pouring. 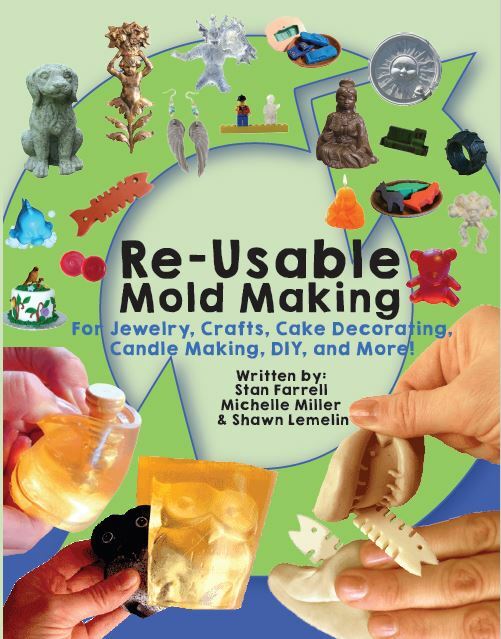 Many casts can be made using the same mold, and when you are finished with that mold, you can re-melt it and re-use it. ComposiMold is designed and perfected for use with hobby, arts, and craft projects for duplicating sculptures, models, 3D printed parts, and artistic creations. Action figures, sculpture, prototypes, and more. Provides you the tools for great details (picks up fingerprints) in your mold making without having to worry about mistakes or wasting material. ComposiMold is a flexible, rubbery, thermoplastic that is great for mold parts using many different casting materials including plaster, cement, epoxy, polyurethane, and many others. ComposiMold Original conforms to ASTM D4236, Safe as an art material. If you want to keep your mold, place it in an airtight bag and place it on a flat surface away from heat. The mold can be kept for many years, and when you are ready: re-melt to re-use. This is no doubt the easiest way to create molds of anything you have. I got it yesterday and I am already creating tons of molds because of how easy it was. Amazing. Hello Mr.Shawn hope all is well. Thanking you ,for information sent. Love composimold! So easy to work with and the detail it gets is amazing. The people are also great and helpful. I'll be pouring another mold in a few days when my clay hardens enough and I'm sure it will be as great as the other ones I've made. Nice to try something mess up and just start all over with out waste. Looking forward to use alot. The ability to re-melt the molds allows me to experiment. If it doesn't work, I just remelt and try again.